History Project WWII 1939-1945. Rise of Dictators in Germany, Italy and Japan Germany, Italy, and Japan were called the Axis of Power. They rose to power. 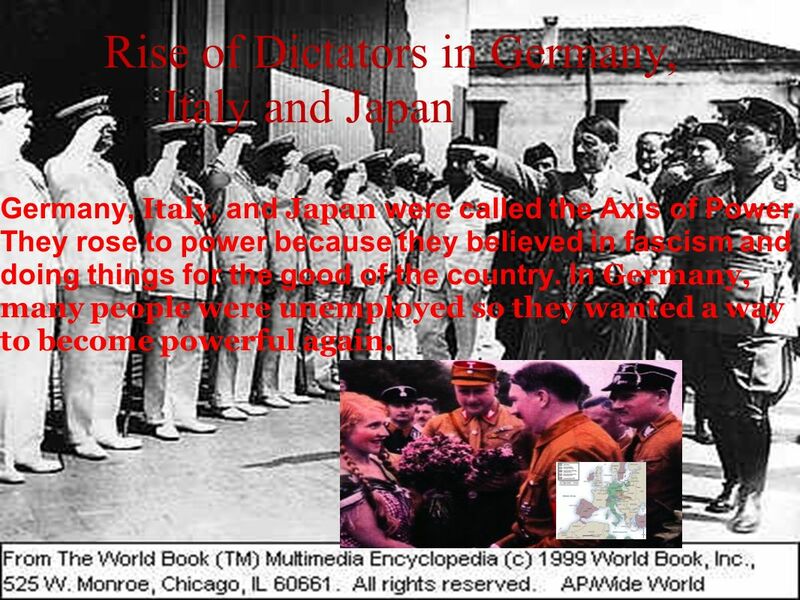 2 Rise of Dictators in Germany, Italy and Japan Germany, Italy, and Japan were called the Axis of Power. They rose to power because they believed in fascism and doing things for the good of the country. In Germany, many people were unemployed so they wanted a way to become powerful again. 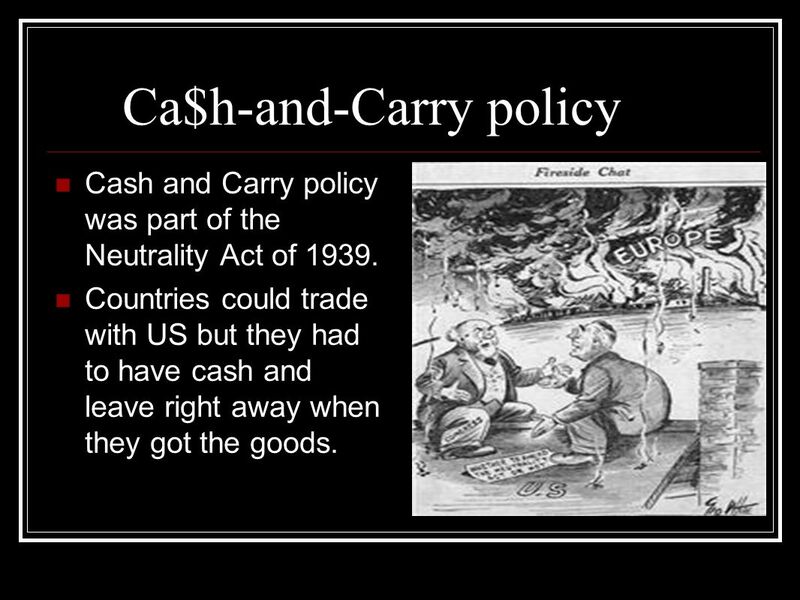 6 Ca$h-and-Carry policy Cash and Carry policy was part of the Neutrality Act of 1939. Countries could trade with US but they had to have cash and leave right away when they got the goods. 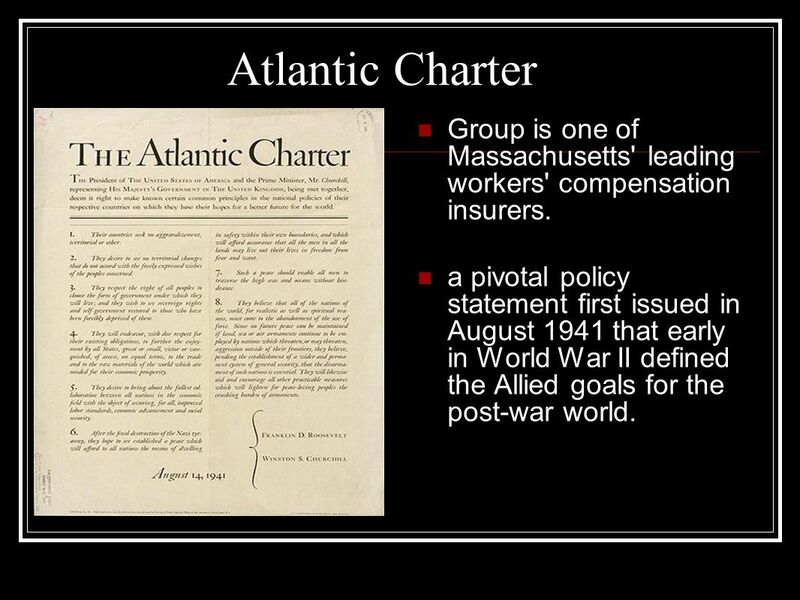 9 Atlantic Charter They were a group of MA compensation workers. Group is one of Massachusetts' leading workers' compensation insurers. a pivotal policy statement first issued in August 1941 that early in World War II defined the Allied goals for the post-war world. 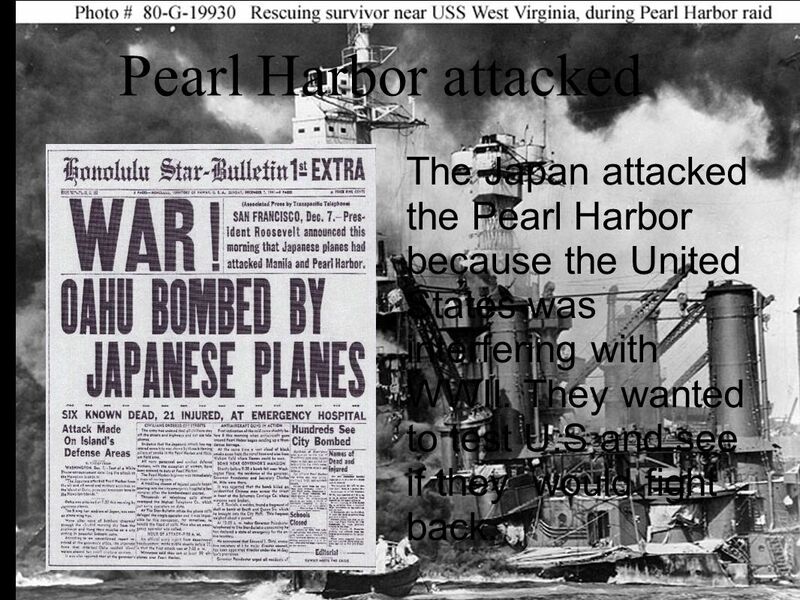 10 Pearl Harbor attacked The Japan attacked the Pearl Harbor because the United States was interfering with WWII. 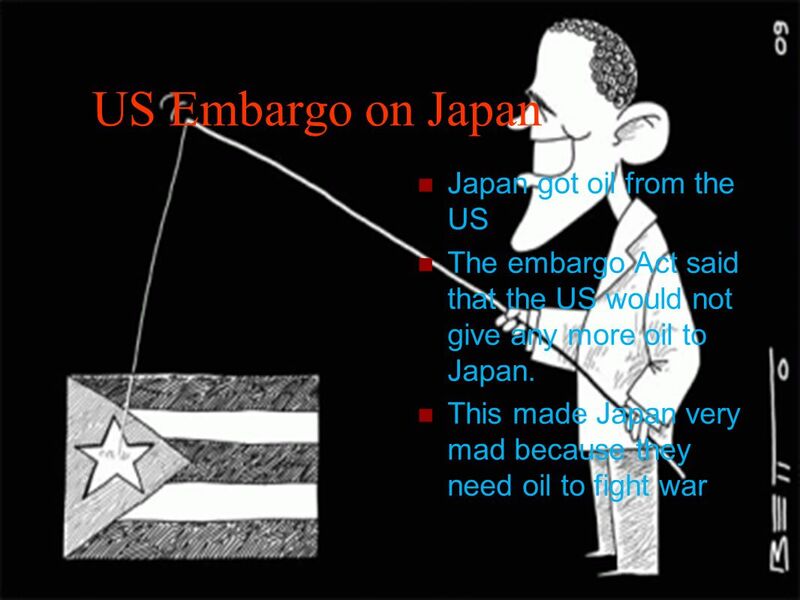 They wanted to test U.S and see if they would fight back. 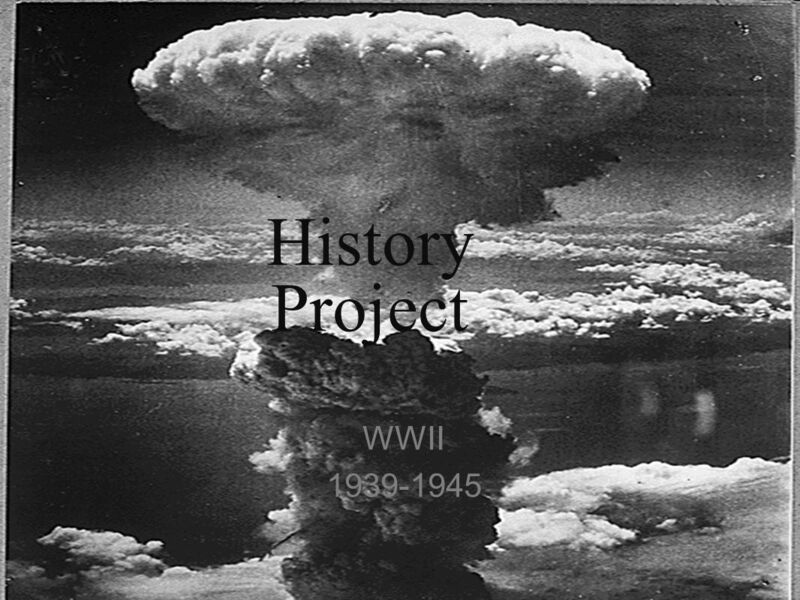 Download ppt "History Project WWII 1939-1945. Rise of Dictators in Germany, Italy and Japan Germany, Italy, and Japan were called the Axis of Power. They rose to power." Drill: Cartoon 1941 What do the two beds represent? How do you know?What do the two beds represent? How do you know? Read the words in the cartoon, what. World War II – War in Europe US History. The Beginning After the failure of Appeasement, the Nazis force their way into combat. The Nazis use Blitzkrieg. America Moves Towards War Ch. 24 sec. 4. 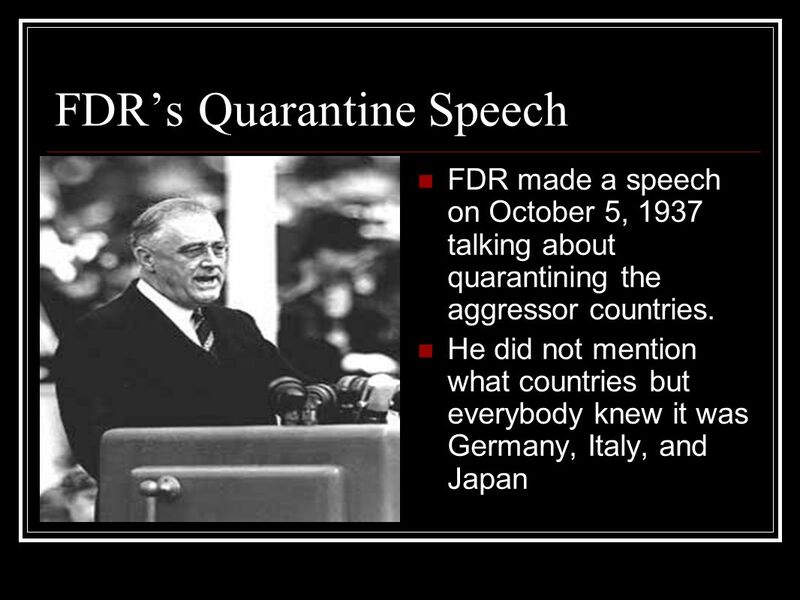 FDR Faces Challenges FDR knew Americans did not want war Also believed Hitler was a Madman and wanted to help. 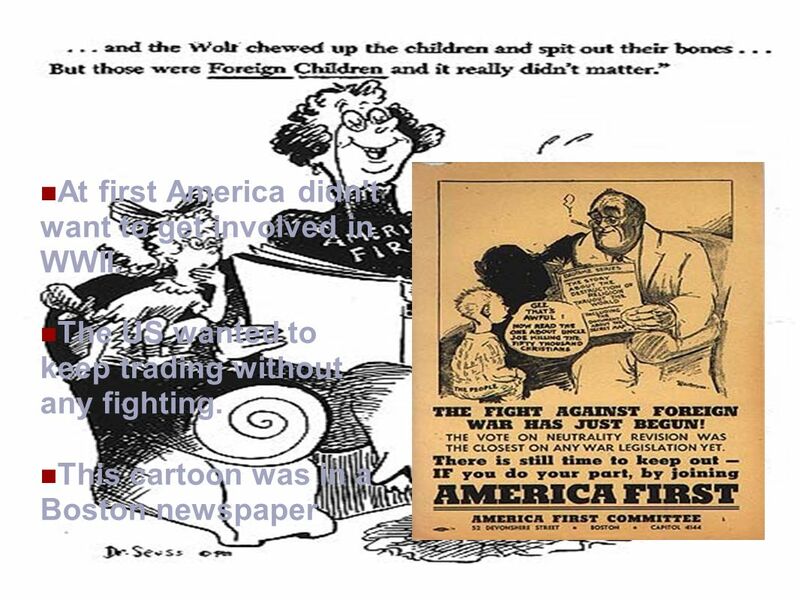 Chapter 24 America Enters the War Section 4 America Enters the War. America Enters WWII FDR Supports England Neutrality Act of 1939 – Public opinion strongly supported him – Warring nations could buy weapons Cash and. Date_____Page____ Title: The U.S. Enters the War. US War Policy & Pearl Harbor United States Policy 1939 Neutrality Acts (1939) Issued by Roosevelt after Germany invaded Poland Official statement. American Response to the Looming Threat of a Second World War Responses to the growing power of dictators TONIGHT: Read up through page 750 (we will discuss. US RESPONSES TO EUROPEAN AGGRESSION. QUIZ TIME : What is A foreign policy dedicated to withdrawing from international affairs called ? One More… PP-t! Well Alright, Alright, Alright. America Moves Towards War Isolationist Viewpoint Interventionist Viewpoint The U.S. should avoid alliances with other nations Americans should focus on. DO NOW – REVIEW ANSWER ON ½ SHEET OF PAPER  1. In what ways did World War I influence the American policy of isolationism during the 1930s?  2. Explain. America Moves Toward War Ch Cautiously Moving Roosevelt wanted to help France and Great Britain fight against Hitler in order to keep the U.S.
Neutrality Acts and Lend-Lease. 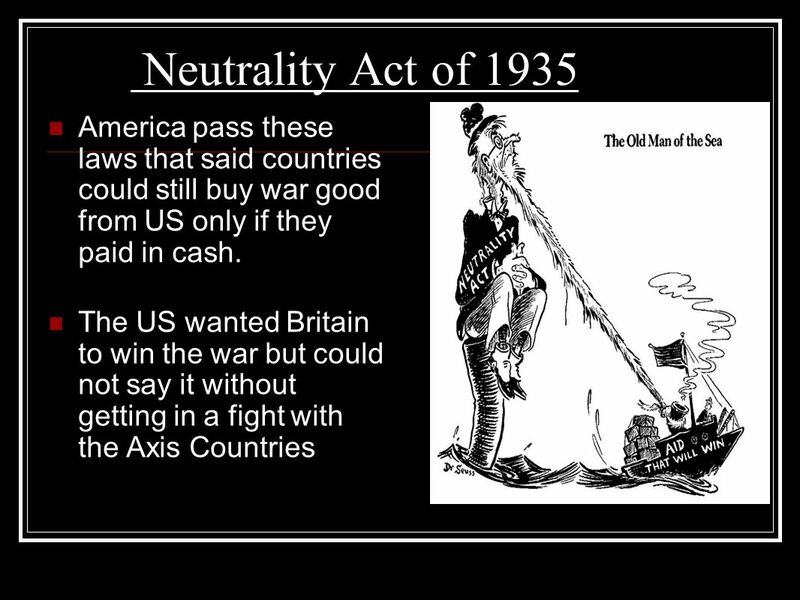 Neutrality Acts 1935 prohibited export of “arms, ammunition, & implements of war” to foreign, warring nations 1937 warring. 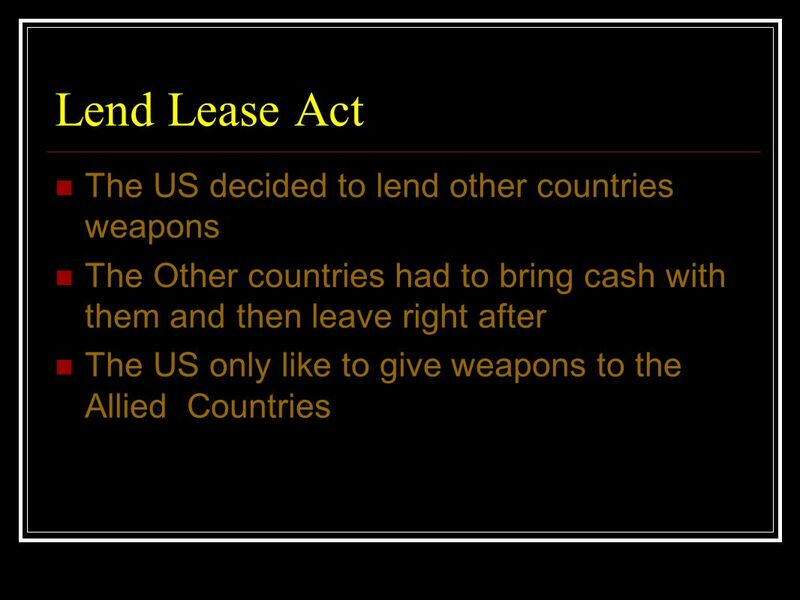 l World War II Key Terms: 1.Appeasement 2.Neutrality Acts 3.Cash and Carry 4.Lend- Lease Act 5.Atlantic Charter. Goal 10 Part 2 Holocaust / American Involvement in WWII.